Once you’ve finalized and saved your request in Postman, you might want to make the same request from your own application. 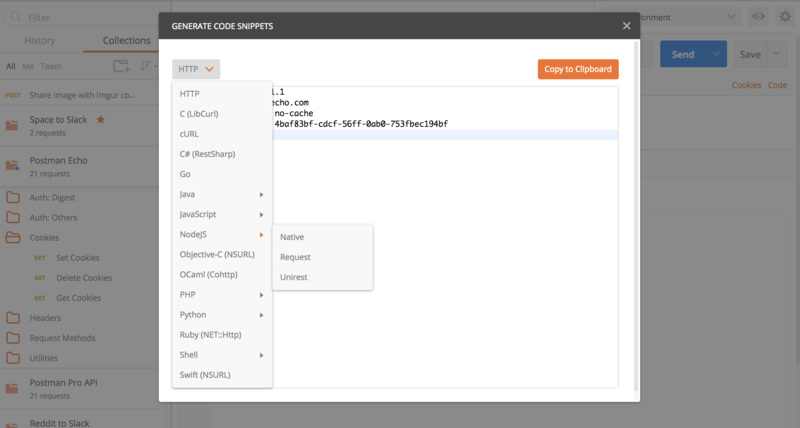 Postman lets you generate snippets of code in various languages and frameworks that will help you do this. You’ll need to click the** Code** link under the blue Send button to open the GENERATE CODE SNIPPETS modal. Use the dropdown menu to select a language - some languages have multiple options. This lets you select different frameworks from which to make your request.